Dentures are used to replace missing teeth and soft tissues with a prosthesis that can be removed. We can use different types of dentures as a solution to your problem. Dentures can replace all of the teeth or a limited number of the teeth. Where all the teeth are replaced, this is called a complete dentures. A denture which replaces only missing teeth is called a partial dentures. Dentures fitted as soon as teeth are removed are known as immediate dentures. 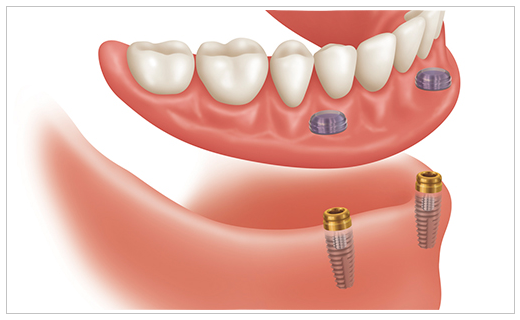 Dentures which clip onto dental implants are called implant retained dentures. They can be a full or partial dentures. 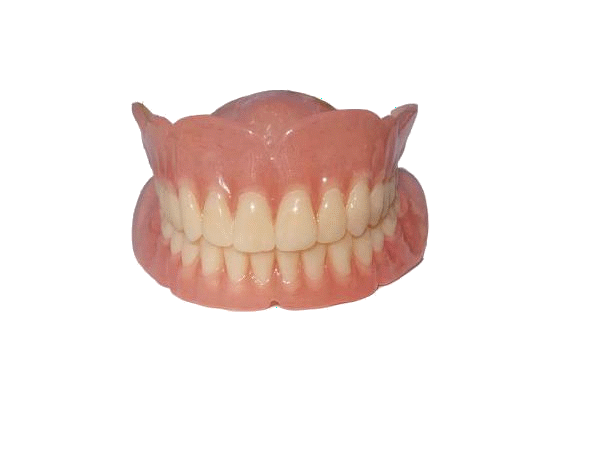 Complete denture are suitable for the patient who has teeth which are failing. This may be due to many causes most commonly gum disease and/or tooth decay. They are held in place by a suction to your gums and denture fixative (poligrip). A set of dentures usually require replacement after ten years. We can replace your loose dentures using the latest techniques. The process takes a period of approximately eight weeks. The cost can be found on Pay As You Go pricelist. The transition from teeth to the prosthesis of a denture can be challenging. Some mouths better adapt and manage full dentures than others. Please download the leaflet at the top of the page which gives more information about immediate dentures. Usually when transitioning from a mouth with failing teeth to a denture, the process involves a series of approximately four appointments, taking impressions and manufacturing immediate dentures. When we have the denture returned from the dental laboratory we can fit it at the time the teeth are removed. This type of denture is called an immediate denture. It can be used for partial or full dentures. 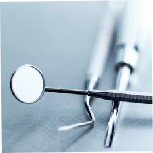 The process of removing all the teeth is called a dental clearance. The teeth and their roots are removed and over the next 6 weeks the healing process starts to reshape the bone and gums. As you can imagine the healing area where your teeth once lived, will be tender for a few weeks following the extraction. With the changes in shape of your gums during the healing process you should expect a period of time where it is difficult to speak and eat. With some patients during the six months following having teeth removed the bone and gums of the jaw change shape causing the denture to become loose. If you suffer this, to improve the denture’s fit you may require addition of more plastic base to your denture (see soft and hard relines for an estimated costs). Immediate dentures are designed to be a temporary solution to allow your mouth to adapt to a denture. Once the ‘shrinking’ of the gums has settled a definitive denture made with better quality teeth, metal or plastic frameworks is constructed. The cost of the definitive denture can be found on the Pay As You Go pricelist. Please note immediate dentures are made from the most economical materials. As result they have a shorter life span. We can only guarantee your immediate denture for six months from when they are fitted. Where a patient has spaces between healthy teeth a partial denture can be used to fill the spaces between the teeth. Different types of partial dentures can be used to provide a prosthesis. The type of partial denture used is dependant upon many factors. Your dentist can advise you about the most suitable partial denture solution. Below is a brief explanation of the different varieties of dentures. An estimate of the cost of denture can be found Pay As You Go pricelist. Plastic dentures are most suitable to patients who are finding they are loosing teeth over the years. Acrylic partial dentures offer the flexibility to add further teeth onto the denture should a tooth need to be removed. We use a higher quality type of denture plastic and denture teeth than generally used for NHS dentures. The process of making an acrylic denture involves four to six appointments approximately a week and apart. Metal framework dentures provide a thin strong less intrusive denture. They are generally considered to be less damaging to gums. The framework has clips or clasps which connect to the teeth. As the framework is metal, the denture can be designed thinner, less intrusive in comparison to acrylic (plastic) dentures. Where limited teeth are available to support a denture or the shape of the mouth causes the denture to become loose easily, dental implant can be used to provide a holding force keeping the denture securely in position. The denture has a clip which attaches to the implant when it is seated in the mouth.